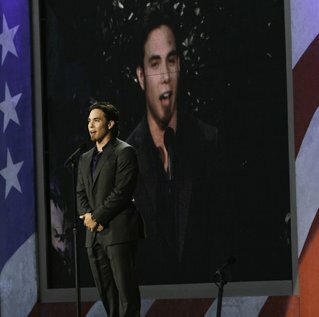 U.S. Olympian Apolo Anton Ohno joined us in 2012 to introduce that years’ Team USA.A Capitol Fourth has a history of honoring U.S. athletes competing in the Olympic Games. In 2008, Olympic gold medal figure skater Scott Hamilton graced our stage and saluted American athletes traveling to the Summer Olympics in Beijing. Four years later, in 2012, speedskater Apolo Anton Ohno, who holds the record for most medals won by a U.S. Winter Olympian, rallied A Capitol Fourth fans by honoring American athletes bound for London. Both send-offs were set to John Williams’ iconic classical score “Olympic Fanfare and Theme,” first composed in 1984. Williams would later say that his theme was intended to represent "the spirit of cooperation, of heroic achievement, all the striving and preparation that go before the events and all the applause that comes after them." Read more about the composition of Williams’ “Olympic Fanfare and Theme." On the 2012 A Capitol Fourth, John Williams conducted his iconic "Olympic Fanfare and Theme." At the 2003 A Capitol Fourth, Williams received the National Artistic Achievement Award, honoring his lifetime contribution as one of America’s greatest musical voices. In 2016, Scott Hamilton returned to A Capitol Fourth and gave a red, white and blue send-off to U.S. athletes competing in the Games of the XXXI Olympiad in Rio de Janeiro, Brazil. “Vinicius” and “Tom” are the respective mascots for the 2016 Olympic and Paralympic Games. Both were “born out of the explosion of joy that followed the announcement that Rio would host the Olympic Games.” “Vinicius” represents a combination of animals native to Brazil while “Tom” is a blend of Brazilian plants and trees. Watch a video about the mascots on Rio 2016’s website. The page also contains a downloadable coloring book and paper toy for children. The Olympic torch relay began on April 21, 2016 in Greece. In May, the torch made its way across the Atlantic Ocean and traveled through the host country of Brazil for over 90 days. To follow the path of the torch, visit the interactive map here.